We do a lot of Eskimo singing and dancing at St. Lawrence Island, but I’ve never heard of them wearing masks. The well-known artist Nemaayaq, born in about 1864, probably made this mask. His work is unusual because masks were rarely used for traditional dances or ceremonies on St. Lawrence Island. Estelle Oozevaseuk: I know that this kind of wooden—only the one who resides at Kangii [place name on St. Lawrence Island known as Camp Collier], Nemaayaq, good with woodwork, he makes something like this. In the springtime, he came down to Gambell when the whaling started. There was a little wooden human right above their window on their house. That house was scary. They had all kinds of masks like this. They’re the only ones, Nemaayaankut [Nemaayaq family]. 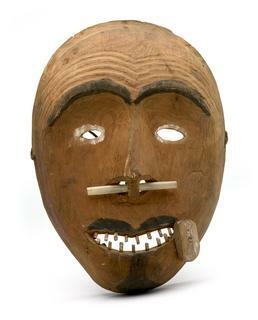 Taakunginaghhaagut mask-engllaqayuget, mask-engllaghtet [they were the only ones who made masks, mask-makers]. Sangllaghtaakat [they made other things]. They colored them like that after they’re done, everything they make. Even the dishes they make, there’s some face like that somewhere on the end or handle out of wood. Suzi Jones: Was he the only one that carved figures and masks and things? Estelle Oozevaseuk: Nemaayaq’s older brother became a shaman. I listened to him. The shamans used to sing at night and also in a dark room, only the outer light, because they have to perform in a dark place. I listened, but my grandparent did not want me to. I liked to go with them. They got together, mostly older people got together [with the shaman], just to know about what’s coming, their future. This shaman told about the future of a person, and also some of them are healers. Grandpa said, “Don’t go with us, because I don’t want you to learn about those.” There are two kinds, evil and good shamans. One is killing, the other one is healing. They [bad shamans] just try to get something out of the person who mostly many things, like skins and other things. They try to get things from them in exchange. If he cheats trying to heal the person who is sick, instead that person dies. That’s a bad shaman, because grandpa said the demons are just cheating him. If he ends up getting sick, all of them will abandon him. Nobody, nothing will help. He’s just using that person. But the good shamans are the ones that are good. I know that my grandfather’s cousin became a shaman. That’s a very fearful thing for people. Moses Sunaaghruk [Soonagrook] was doing that, my grandfather’s first cousin, and it seemed to me like most of the people in their home were not religious. Elders from Presbyterian church were there all the time trying to . . . these powers clashed together, and it’s a terrible time they had. But the religious people have won, no more shamanism. I know that. Jacob Ahwinona: That one there [corner of mouth], what do they call in your dialect? Estelle Oozevaseuk: Tuutaq [labret], they called the labrets tuutaq. Branson Tungiyan: My grandpa had a hole like that. He put [a labret] there. Estelle Oozevaseuk: Yeah, that was common in Gambell. Jacob Ahwinona: My grandpa had one hole like right there where he used to [wear a labret]. Estelle Oozevaseuk: That’s like modern time with earrings. Branson Tungiyan: Maanalgukaayaghesta Sivuneput, qengamun? Estelle Oozevaseuk: No, that came from Siberia. Suzi Jones: Did your grandparents have labrets? Aron Crowell: What about tattooing? The lines? Estelle Oozevaseuk: That’s to beautifying things. I tried to get some too, but my grandparent did not want me to. I was asking only for this line [down nose]. Otherwise I would be in the pictures all the time. [Laughter.] They have different patterns too. Siberians had different patterns from Gambell people. Some of their tribes had different pattern too. They’re using soot from the seal oil lamp and a needle with a short thread on. They use that for tattooing. It’s painful. You know Mrs. Apasengaq’s [Pauline Apassingak] picture, she had the clearest ones [tattoo lines on chin]. And one old woman had them clear up to here [upper arm], an Uwaliit [clan name, originally from Chukotka] woman. Maybe there is something behind those, why they’re doing that. And some of them, only four lines here [down nose]. And my auntie has only three lines [down chin]. That came from Kiyalighaq [St. Lawrence Island place name]. Some of the mainlanders only have three lines, because her name is Ungalaqlaq [place name from mainland Alaska]. Jacob Ahwinona: My grandmother had them all through here [chin and back of hands]. Aron Crowell: Was that done at a certain age for girls? 1. This mask was discussed along with mask E045722. 2. According to St. Lawrence Island Yupik Elder Vera Kaneshiro, masks were not used on St. Lawrence Island, but their use is found in stories, which may mean that they were used long ago. Their word for “mask” is gginaqwaaq. The mask is carved of wood and painted red, with a bird quill through its nose, wooden pegs for teeth, and a wooden labret (lip ornament). A second labret is missing. The eyes are outlined in white, and the eyebrows and a mustache are painted in black. The mask was tied on with leather thongs. Nemaayaq was a well-known St. Lawrence Island artist whose work included masks, according to Estelle Oozevaseuk, and who probably made this mask. (3) Archaeologist Otto Geist visited the artist’s home at Kangii in 1927 and wrote, “Here lived Numaiyuk [Nemaayaq], a brother of the strongest shaman on the island [Asunaghaq], and carver of many dolls, idols, fetishes, and ornamented household utensils fashioned from driftwood .
. .”(4) Nemaayaq was 56 at the time of the U.S. Census in 1920 and so was born in about 1864. (5) He was a survivor of the great famine or epidemic that killed more than half of the island’s population during 1878-80, and was probably old enough at the time of Captain Hooper’s visit in 1881 to have been the creator of the mask that Hooper collected.